Marshall First UMC sponsored three community projects for Change the World Day May 19. A group of volunteers headed by Joe Schroder, lay leader, painted the office building at the Marshall Cemetery. The Cemetery Board provided the paint and the group provided the labor on the hottest day of the year so far. 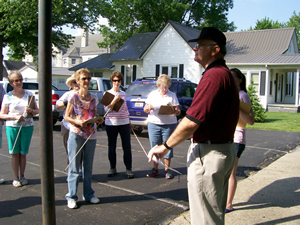 A second volunteer group headed by Alan Gossmann, church member, participated in a sidewalk survey for the City of Marshall. Participants chose various routes to walk and chart where the walks needed to be repaired. This project will be ongoing until it is completed. We plan to finish this summer. The third project was a community wide appeal for donations of peanut butter for the Marshall Food and Clothing Cooperative. Peanut butter was collected from area collection sites. 60 large jars of peanut butter were delivered. The 25 volunteers enjoyed lunch and visiting together at noon in the second parsonage now used for church activities. Ideas for next year's Change the World Day are now being discussed.